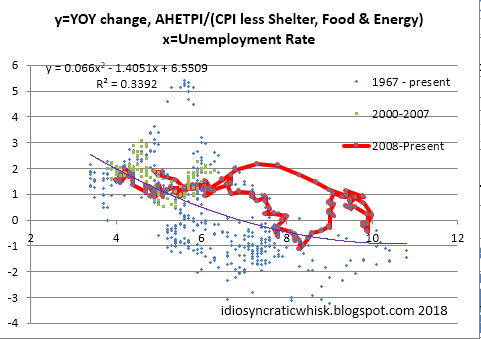 There is a relatively stationary long-term relationship between real wage growth (I prefer using CPI less food, energy, and shelter as the deflator) and the unemployment rate. Here are a couple of charts comparing real wage growth and unemployment. 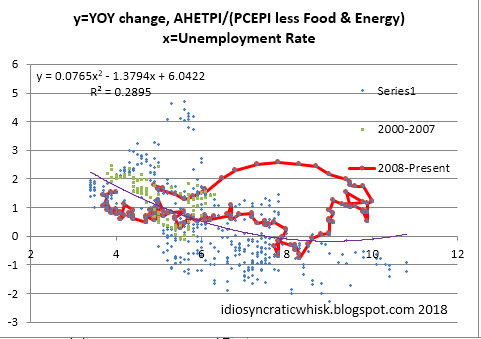 My contention is that the Phillips Curve is real, not inflationary. It only appears to be inflationary when monetary policy is procyclical. When unemployment is low, real wage growth is higher, largely because of better matching, fewer frictions in labor markets and higher labor productivity. We shouldn't be afraid of real wage growth. And, in either case, wage growth is humming along pretty close to the long-term trend. Celebrate that unconditionally.